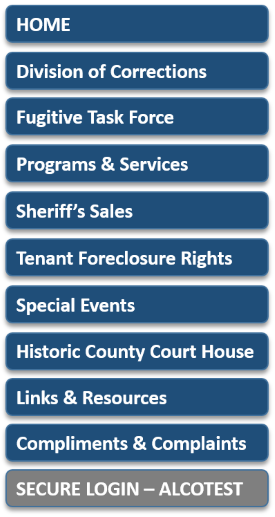 A duty of the Sheriff is to conduct the sale of real property after foreclosure proceedings have been completed. The Sheriff’s Office does not know whether structures occupy the property. Furthermore, the Sheriff’s Office cannot give permission for any prospective bidder to enter and inspect any property being sold. All properties sold at auction at the Sheriff’s sale are advertised on Thursdays in the Hunterdon County Democrat, and one other paper published in or near the municipality in which the property is located. Advertisements appear four weeks prior to the initial date of sale. In addition to the newspaper advertising, notices of sale are posted for public viewing at the Sheriff’s Office in Flemington. Although the Sheriff’s Office does not provide or distribute a list of the properties to be sold, a list of properties will soon be available and routinely updated on this website. Persons interested in following up on these properties should always make their own lists by checking the legal advertisements in the newspapers. Sales of property are “open-type” auction sales. There are no sealed bids. 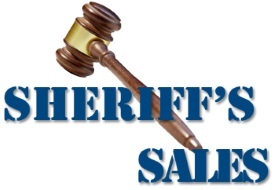 Persons expecting to bid should register with the Sheriff’s Office prior to the sale. A minimum bid of $100.00 by the plaintiff is made to begin the bidding. All subsequent bids are for a minimum of $100.00 each. The property is sold to the highest bidder. The successful bidder, upon full payment of his/her bid, will receive a Sheriff’s deed. All sales are subject to specific “conditions of sale.” These conditions are read at the sale to explain the rules of the sale, but do not address possible restrictions of record, unpaid taxes or assessments, or any other encumbrances which become the responsibility of the purchaser. The Sheriff’s deed does not give clear title and the Sheriff’s Office does not have any knowledge of any of the above-mentioned encumbrances. If you are interested in a particular piece of property, the Sheriff recommends that you conduct a title search before you actually bid. You can do that at the Hunterdon County Clerk’s Office or hire a private title searcher. Title search companies may be found in the yellow pages of the telephone directory. If you are the successful bidder on a piece of property, you are required to post a deposit of 20% of the total bid in cash (up to $2,000.00), certified check, cashier’s check or treasurer’s check immediately after the close of that sale. To determine what funds you may need as a deposit, you must determine what your highest bid will be and then make out the appropriate checks or bring cash for 20% of that amount. Checks should be made out to yourself. It is also recommended that you bring checks for lesser denominations in the event that you do not need to bid to your pre-determined maximum. If you are the highest bidder, you would then endorse the checks over to the Sheriff’s Office. Immediately at the conclusion of the sale, should the successful bidder fail to sign the conditions of sale and pay the 20% deposit as required, the Sheriff will immediately resell the property without further advertisement. The balance of the bid is due along with all fees within twenty (20) calendar days from the date of sale. However, if the balance is not paid within ten days, the purchaser must pay lawful interest at the current rate on the full amount of the bid up to the date that full payment is made. If the purchaser fails to comply with the conditions of sale or fails to make full payment within the allotted time, the property will be sold a second time. The former purchaser is held responsible for all losses and expenses. Additionally, the initial deposit will be retained by the Sheriff’s Office and disbursed only by court order. Upon full payment, the Sheriff’s deed will be delivered to the purchaser within thirty (30) days from the date of sale. Purchasers are not entitled to possession of the property until the delivery of the Sheriff’s deed. If the property you purchased is occupied, it is your responsibility to have the occupants removed. Deed recording fees must be paid by the purchaser to the County Clerk when a deed is recorded. Even after the sale, the property can be redeemed by the original owner within a period of ten (10) calendar days from the date of sale. If for some reason the redemption period is extended beyond ten days, an announcement to that effect will be made prior to the sale of the property. There are times when the sale of property is not conducted on the date advertised because of adjournments, settlements or bankruptcies. It is recommended that you check the website or call the Sheriff’s Office on the date the sale is scheduled to determine the status of the sale. It is also strongly suggested that bidders make themselves familiar with the legal aspect of Sheriff’s sales prior to bidding. Consult with a professional such as an attorney, if you do not understand the sale process and its legal implications. If you have any other questions, you can call the Sheriff’s Office at (908) 788-1166, Monday through Friday. Visitors and guests are welcome to observe a Sheriff’s sale.